Bliss. I'd like to find some bliss right about now. Life is a bit crazy in my house at the moment. We have our beautiful new puppy keeping us on our toes and we are moving house next week, so the place is a bit of a disaster as boxes are being packed and stacked and such. I like my routine and I like things to be in their place. Nothing is routine right now and nothing is in it's place. LOL! But, alas, it will all iron out soon and I am looking forward to our bright, happy new apartment. It has WONDERFUL natural light. I think that is what I am most excited about! LIGHT! I created this card using the awesome July embellishment kit from Pinkfresh Studio. Yup, it's awesome. I know I say that every month, but there is a reason for that! Seriously, though! I love the elements in this kit! It is one of my favorites for sure! 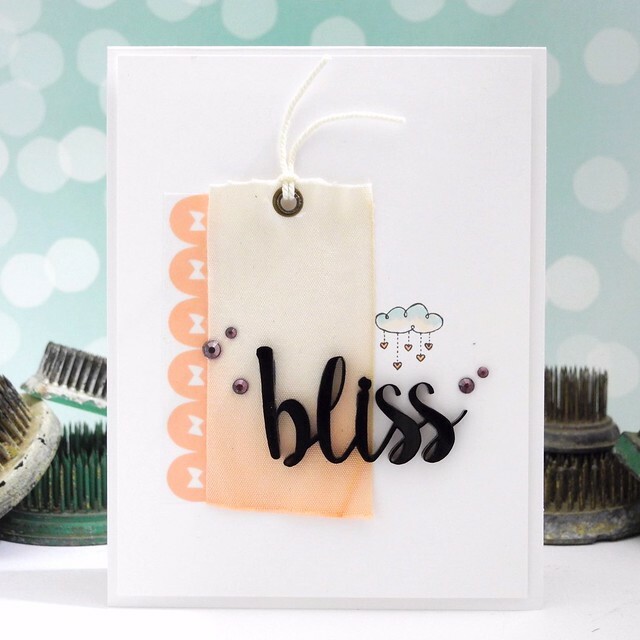 I used one of the fabulous dip dyed canvas tags along with the Bliss acrylic word made for PFS by Color Cast Designs. I am in LOVE with these acrylic words! The washi tape made a perfect border and the little cloud is from the stamp set, I simply colored it with Copics. Pinkfresh Studio kindly sends me the kits as a member of their Design Team to showcase. To see more awesome stuff be sure to check out the Pinkfresh Designs blog and Instagram! Amazing!! LOOOOOOOOOOVE the light, airy feel!!! And the colors are soooo pretty!! Gorgeous card!!!! Beautiful card! Love the bold sentiment against the soft background. It's funny you should mention natural light, that was one of the things I was most excited about our new place too - light! Good luck with the move, I'm sure you'll be settled in in no time! I really love this. Perfect combination of element, that little cloud is so cute, I love the border with the tag and that great sentiment.